Severe winter weather, with wide-ranging temperature shifts, have caused significant damage to area roadways in the form of potholes and cracks. As the snow and ice reluctantly recede from area roadways, the pavement beneath looks quite a bit worse for wear after a long stretch of nasty winter weather patterns. Potholes and cracks are caused by the continual cycle of the earth freezing and thawing — contracting and expanding — beneath the pavement. 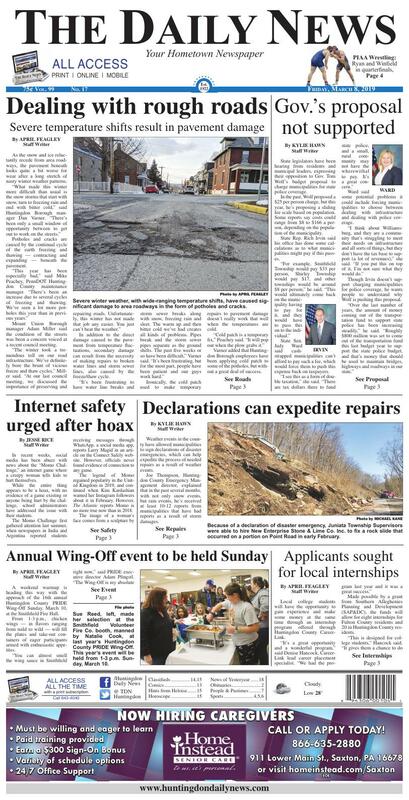 Mount Union Borough manager Adam Miller said the condition of the streets was been a concern voiced at a recent council meeting. In addition to the direct damage caused to the pavement from temperature fluctuations, secondary damage can result from the necessity of making repairs to broken water lines and storm sewer lines, also caused by the freeze/thaw cycle. Ironically, the cold patch used to make temporary repairs to pavement damage doesn’t really work that well when the temperatures are cold. Varner added that Huntingdon Borough employees have been applying cold patch to some of the potholes, but without a great deal of success. Once spring arrives and materials are once more available to “hot patch” the damaged pavement, Varner looks forward to being able to conduct more durable repairs. Peachey said the same applies to Huntingdon County as a whole. Potholes can be reported to the county office of PennDOT or may be reported online at customercare.penndot.gov/. Because of a declaration of disaster emergency, Juniata Township Supervisors were able to hire New Enterprise Stone & Lime Co. Inc. to fix a rock slide that occurred on a portion on Point Road in early February. Weather events in the county have allowed municipalities to sign declarations of disaster emergencies, which can help expedite the process of needed repairs as a result of weather events. Joe Thompson, Huntingdon County Emergency Management director, explained that in the past several months, with not only snow events, but rain events, he’s received at least 10-12 reports from municipalities that have had reports as a result of storm damages. “The incidents range from individuals on private property to larger things, like a rock slide in Juniata Township, portions of roads being lost in Cromwell and Porter townships and a mudslide in Henderson Township,” he said, also noting that storm damages reported also date back to last summer when another portion of the Muddy Run caused more of a subsidence to collapse near Ninth and Moore streets in Huntingdon Borough. While there’s no guarantee of any state funding, Thompson said declarations of disaster emergencies allow municipalities to expedite the process of repairing any damages related to storms. Though this is only Thompson’s second winter as EMA director, he said he’s received more reports from municipal emergency management coordinators (EMCs), as more people learn about this process. “I think it’s partly because of trying to get the word out about the process of a declaration of disaster emergency,” he said, noting that when it comes to that at the county level or municipal level, Thompson assesses the situation closely before a declaration is signed. Before any funding can come from the federal level to reimburse for events, the state has to reach its threshold of damages for a storm event, which hasn’t happened recently. “If we hit the county threshold of $130,000, we can submit that to PEMA, but the state threshold is $17 million, and we haven’t reached that yet. Sue Reed, left, made her selection at the Smithfield Volunteer Fire Co. booth, manned by Natalie Cook, at last year’s Huntingdon County PRIDE Wing-Off. This year’s event will be held from 1-3 p.m. Sunday, March 10. A weekend warmup is heading this way with the approach of the 16th annual Huntingdon County PRIDE Wing-Off Sunday, March 10, at the Smithfield Fire Hall. From 1-3 p.m., chicken wings — in flavors ranging from mild to wild — will fill the plates and take-out containers of eager participants armed with enthusiastic appetites. As in past years, the event is sponsored by Brenneman’s Meat Market, which provides vendors with wings for the event. Just like all the previous years, getting ready for the event involves an impressive amount of chicken wings. This year, 10 vendors will participate with entries in three categories — hot, barbecue and specialty. A panel of 12 “secret” judges will taste test the wings in each category and rate the submissions for flavor, amount of sauce and how well the wing has been prepared. In addition to the judges’ determination, Wing-Off diners will also be afforded the opportunity to vote for the winner of the annual Peoples’ Choice Award, with one voting ticket provided for every dozen wings purchased. “Everything but the Peoples’ Choice Award will be announced at the Wing-Off,” he said. “The winner of the Peoples’ Choice Award will be announced on live television during the Telethon at 2 p.m. Saturday, March 23. Since the event originated, popularity has grown exponentially, with hundreds of people flocking to the fire hall to enjoy the offerings. The secret to the success of Wing-Off is in the sauce — and the overwhelming community support year after year. Eager diners typically begin to queue up outside the fire hall around noon, but no wings will be served until 1 p.m. The Wing-Off is an “appetizer” of sorts to the much anticipated Huntingdon County PRIDE Telethon, which will be begin at 4 p.m. Wednesday, March 20, and run through Saturday, March 23. The PRIDE calendar has many events scheduled in the weeks leading up to the Telethon, so for more information, visit the agency’s website and Facebook page and watch The Daily News in the coming weeks for a full list of events. In recent weeks, social media has been abuzz with news about the “Momo Challenge,” an internet game where a creepy woman tells kids to hurt themselves. While the entire thing appears to be a hoax, with no evidence of a game existing or anyone being hurt by the challenge, school administrators have addressed the issue with their students. The Momo Challenge first gathered attention last summer, when newspapers in India and Argentina reported students receiving messages through WhatsApp, a social media app, reports Larry Magid in an article on the Connect Safely website. However, officials never found evidence of connection to any game. The legend of Momo regained popularity in the United Kingdom in 2019, and continued when Kim Kardashian warned her Instagram followers about it in February. However, The Atlantic reports Momo is no more true now than in 2018. The image of a woman’s face comes from a sculpture by a Japanese special effects company that started circulating on the internet in 2016, according to Vox. It most likely got attached to the rumor through Reddit, an internet forum, according to Magid. The fervor around Momo seems to be driven more by parental and media panic than any evidence. Though the challenge was a hoax, some schools gave parents warnings about internet safety with their children. Parents of Southside Elementary School students received a letter this week, making them aware of the challenge. Southside Elementary officials could not be reached for comment as of time of press time. Juniata Valley School District did not have any official statement on the challenge, according to school social worker Stephanie Galloway-Maslanik. However, they are in the process of releasing an edition of their Valley Soup podcast discussing this challenge, similar challenges and other social media related topics. Galloway-Maslanik explained that when people were concerned about the idea of clown presence several years ago, she met with many children who were concerned about it. However, very few people have asked her about the Momo challenge hoax. However, the hoax still offers parents a chance to consider how their children approach internet safety. “Parents just need to be aware of what their children are hearing about, reading about and seeing on the different social media platforms and the internet in general,” Galloway-Maslanik said. If a child is not aware of the challenge, Galloway-Maslanik said parents should not feel compelled to tell them about it. Parents also should keep themselves well informed so as not to cause panic around hoaxes like the Momo challenge. “Parents need to make sure they are aware of what their kids are coming into contact with and that they are looking at good sources to be able to give facts and reassurance instead of increasing the alarm,” Galloway-Maslanik said. She recommended Shape The Sky, which has a website and Facebook page dedicated to giving parents resources on how to help shape their children’s smartphone usage in responsible ways. “It has very good resources on having conversations with kids, what apps they are using, knowing what they are searching, and knowing what conversations they are having,” she said. In the end, though the hoax caused a social media stir, it may have provided parents with a good reminder of how to help their kids approach the internet. “The most important things are open conversation, monitoring and awareness of social media/app usage,” Galloway-Maslanik said. State legislators have been hearing from residents and municipal leaders, expressing their opposition to Gov. Tom Wolf’s budget proposal to charge municipalities for state police coverage. In the past, Wolf proposed a $25 per person charge, but this year, he’s proposing a sliding fee scale based on population. Some reports say costs could range from $8 to $166 a person, depending on the population of the municipality. State Rep. Rich Irvin said his office has done some calculations as to what municipalities might pay if this passes. State Sen. Judy Ward said cash-strapped municipalities can’t afford to pay such a fee, which would force them to push this expense back on taxpayers. Ward said some potential problems it could include forcing municipalities to choose between dealing with infrastructure and dealing with police coverage. Though Irvin doesn’t support charging municipalities for police coverage, he wants people to understand why Wolf is pushing this proposal. Irvin said the state legislature set parameters in the most recent budget to lower the amount of money taken from the transportation to fund state police from $800 to $500 million, but that’s still money that can be used to fix infrastructure. “That’s why it’s become an issue with the governor,” he said. Irvin has a couple of things that he feels the legislature should look at before charging municipalities for police coverage. Another suggestion Irvin has is to potentially pass a bill that allows sheriffs and sheriff deputies to have more power in the state. Ward agrees with Irvin there needs to be another way to deal with the issue of funding state police partially through the transportation fund. “We have to think outside of the box a little bit,” she said. Local college students will have the opportunity to gain experience and make some money at the same time through an internship program offered through Huntingdon County CareerLink. Made possible by a grant from Southern Alleghenies Planning and Development (SAP&DC), the funds will allow for eight internships for Fulton County residents and 20 in Huntingdon County residents. By partnering with a variety of businesses, agencies and organizations throughout the region, interns gain valuable, real-world experience within their chosen fields. A partnership with Juniata College also provides instruction in professional development. Those college students accepted into the program will work for eight weeks and will be paid $12.94 an hour for up to 40 hours a week. The internship opportunity may also satisfy college internship requirements as participants complete 320 hours over the summer. Applicants who are currently enrolled in college are encouraged to submit a letter of interest and resume to their local CareerLink office by May 1. Interested employers are likewise encouraged to contact CareerLink about the possibility of hosting an intern. For more information, contact Hancock at dhancock@emp-trng.org or 641-6408.